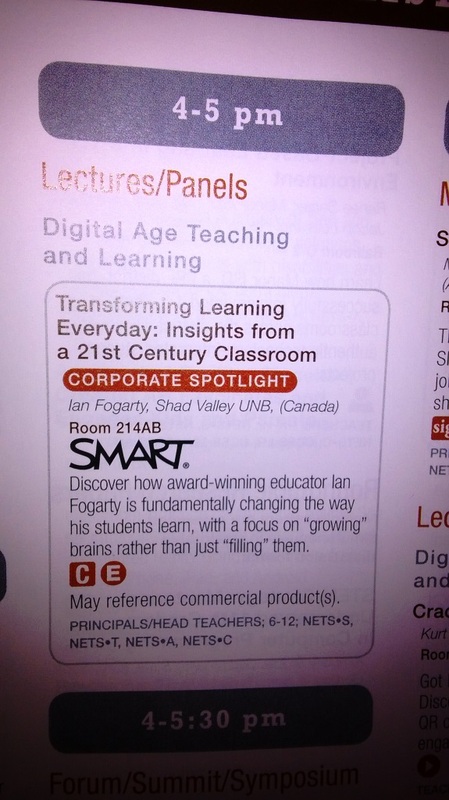 Here in Freddy on a Saturday with many people from around looking at tech tools for education. 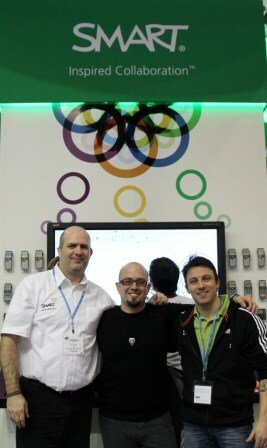 Richard Bryne did a great presentation on showing off different tech tools. Cork board me could be cool for group work perhaps displaying on a side smart board. Type with me for group editing..maybe kids gather around a board and they edit a lab report together. Co-sketch is a collaborative drawing pad. Draw on the.net will allow you to annotate on a web page without a smart board. Today’s meet is like a private twitter similar to what we wanted for the Xeon debate. We transfer is a nice way to transfer 2G of files to someone without creating a Dropbox folder. Tagxedo….does a wordle in the shape of a pic. Blabberize is a cool place to take a pic, create a mouth, and then attach a homemade audio. It will create a video. Egg timer is a cool web timer. Just type in the address followed by the desired time. My online-egg timer is more robust with multiple timers. QR treasure hunt makes an easy qr code treasure hunt. Edhead has some cool elementary and middle school animation/simulations. QR voice..you type short text, it creates a qr code and then when the user views it, there is a computer generated voice. View pure…type the URL from YouTube and it removes the add, and in appropriate content. Jeopardy labs, an updated version of the old power points but up to 12 teams. Tackk.com is a cool place to create a poster. Powerful but easy. Remind 101 allows to send text reminders without collecting student info. “Explain everything” is an app for making a YouTube video from iPad. It is a combination of smart notebook. Screen capture, video editing and export to YouTube. Examiner.com will let you work for income to examine different items in our are. It is like an educational review meets blog. Dan Rothstein – sparking curiosity…how to ask good questions. He has an interesting graph of reading and writing skill acquisition vs age, and then overlays asking questions. It plummets. He is from ” the right question institute”. – ask as many as possible. Prioritize to your top 3 questions? Elaine plybon is a self professed tech dependant teacher. Search stories video creator creates a short video of your google searches and use it to tell a story. Google search stories video creator. Pic collage is a nice way to make a collage. Aero..a water bird flying over the ocean. Iprompt pro.. It is a TelePrompter. Dennis Grice keynote on finding your spark. 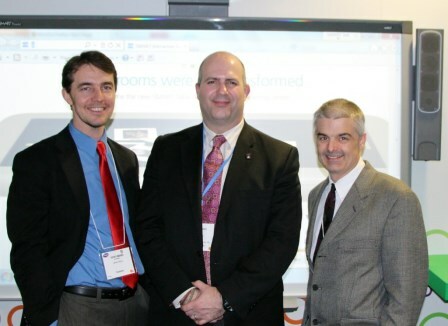 Eduwin to share online teaching successes. Include it as a hash tag on twitter. Denconnects.com to connect teachers to other classrooms. Note shelf for iPad the link to Evernote. There is an interesting way to show video. Look at what if qr codes and the ugly duckling. 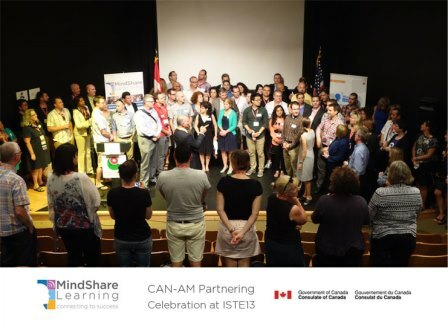 While at ISTE, Robert from Mind Share Learning organized a wonderful Social event to celebrate the great continued work they do and the partnerships they have formed. 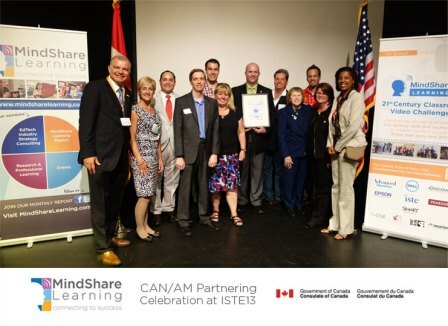 Part of that celebration was the formal presentation of my certificate as one of the winners of the 5th annual Mindshare Learning 21st Century Learning Video Contest. Such an honour and privilege to be in that group. 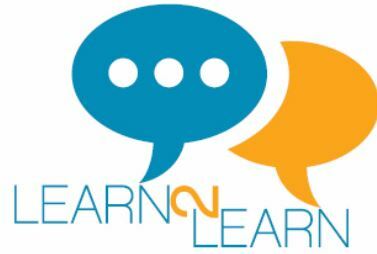 I’m using my only 2 days of vacation from Shad Valley UNB to attend the Learn2Learn conference a Rothesay Netherwood School sponsored by UNB Education faculty. The Shad Valley kids just finished a trip to the Huntsman Marine Center and so I was late coming into the conference hall. The closest table had Anglophone East people like John Tingley, Liz Nowland, Chris Ryan, and Bruce Ryan there. It turns out that there are two presenters from RHS, Chris and I. That is a significant percentage of the total presenters. I think that says something. There are lots of great conversations happening. The vast majority of them claim to talk about collaboration, but they fall into a couple of categories “Divide and Conquer, or the Funnel”. The way that they are using things like Google Apps revisions still focus on the final product as the important thing rather than the process.Good students know they are good, but perhaps not why, and the struggling students do not get a chance to watch editing in progress. The SMARTBoard model of peer editing during class time is NOT about helping the author of the work, but rather about helping the EDITORS. This is where the higher order thinking and critical thinking is taking place. 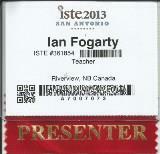 Hello San Antonio, home of the Alamo, and ISTE 2013. What a cool place. So nice to meet Charity again. I met her on Twitter and as a SEE, then F2F at the SES in Colorado a couple weeks prior to ISTE. 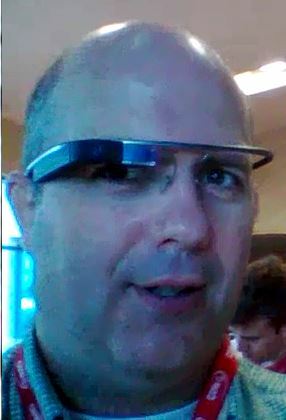 She introduced my to google glasses. I wonder what our exams will mean when everyone has these glasses! what kind of freedom will we have to innovate when the tests are minimized? I got to meet David Warlick in person again after 7 years. We originally met in Fredericton and I told him about the Shark project. He has been using that example in his talks ever since. I have so many new things for him now. 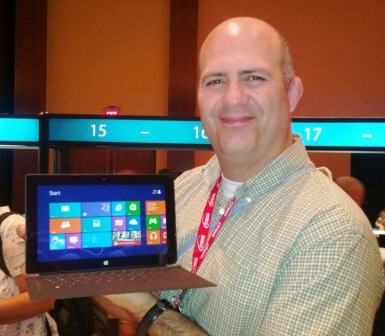 Microsoft gave away 10000 Microsoft Surfaces. I got mine. Microsoft could have a real’ chance to infiltrate the Education realm with this one. If they can win in schools, they can win everywhere. I also had a Spotlight talk when I gave examples of 21C Projects. the VP’s of major companies were only able to attract 50 in a venue ready for thousands. I had 140 people attended my talk. Not bad. Cool things like this Guzzler happens when you give middle school kids a real problem, some parts and some soldering irons. The STEM Educators Symposium (#SES2013) is being held in Fort Collins, Colorado. I am giving the introductory Keynote and a workshop. New waters for me. I am used to giving talks about how to teach and use tech, but not necessarily about pumping people up and inspiring them for a week of professional development. I had the GREAT priviledge of participating in the C21 Canada Summit. It was fantastic reconnecting with people, many of whom were strangers just one year ago, but now strangely feel like long lost friends. The power of a face to face, social media to maintain contact and a common goal. Thanks for going out of your way to pick me up from Downtown TO Camille. Thanks to Zoe for making me feel so welcome and Thanks to Rod for challenging my perspective and making me feel my perspective is valued. The talk this year was great and necessary. I wonder if the next year needs to be the teacher, student voice. There seemed to be consensus that we agree with the 21C in principal, but few people in industry, or politics or classrooms have any real concrete examples to follow. They are out there, let’s show them off. Let’s give them glimpses of the promised land so that they can create their own!! 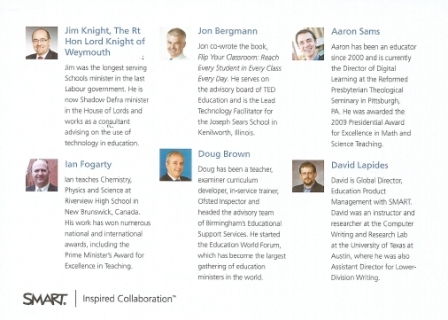 One of my educational mentors and friends won an award for international educational development. I was so happy when I realized you won this award. Thanks for the inspiration personally and professionally, Bill. 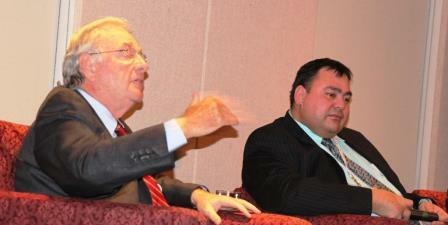 And getting a chance to listen to former Prime Minister Paul Martin talk about education was inspirational. It means something more because he is waking his talk. He said many cool things, but there was one thing that he said that seems to obvious to someone as simple as me. It was almost a “self evident truth”. I am paraphrasing his content. He was much more eloquent. Any jurisdiction that cuts funding to education, particularly in a deficit budget is causing an exponentially step spiral downwards. You cut out the hope of the future. It is paramount to child abuse to take away the education of a young person. We do not have the right. You can put off building a road for a year or two. You can put off having a balanced budget for a year or two. You will get there. But if you postpone funding for even 1 year, that 6 year old is damaged for life with impacts that last generations. If it is self evident, obvious and paramount, why is education often the brunt of budget cut?? It is like we know that smoking is unhealthy and complain about our level of health as we puff another cigarette. Maybe education should be politically agnostic somehow? 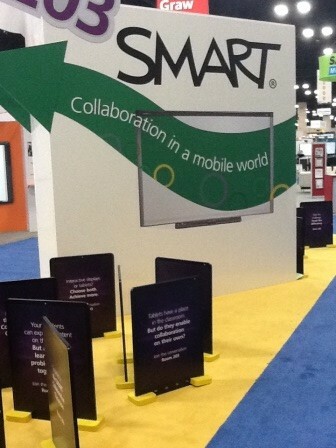 A particular thanks goes out to SMART Tech for sponsoring my attendance. Yet again, they are most generous. Thank you to RHS and Anglophone East for allowing me to be away. 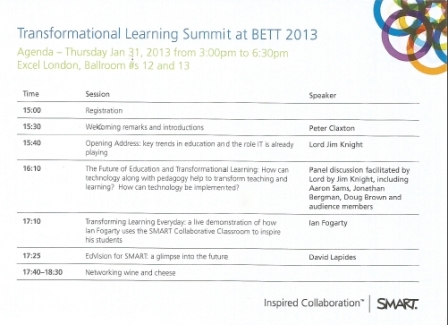 Just got back from BETT 2013 in London UK. It was a fantastic Experience! 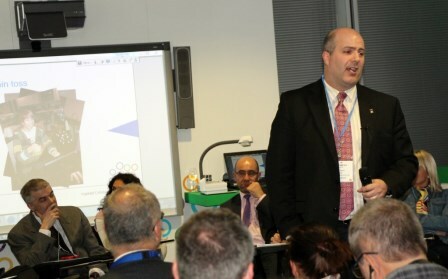 Some Educational Highlights were the Transformational Summit, were I was introduced by Lord Knight of the House of Lords to give a talk on Collaboration in my room. In the audience were Mr. Bergmann and Mr Sams of “flipped Classroom” fame, Ministers of Ed, VIP’s and Superintendents from EMEA (Europe, Middle East and Africa). it was a bit surreal to be speaking to such an influential group. More than that, they seemed that they were intrigued. Also of importance was a few conversations that lasted more than an hour with a teacher from Connecticut (originally form Peru), and two gentlemen from Nigeria and the UK. Teachers are teachers everywhere. and as Aaron Sams said, “I do not care much bout the name, I am just interested in good teaching”. Although he was talking about the “Flipped Classroom” label. I think it could be applied globally. Of course there were lots of non-academic highlights. Thank you to the SMART employees. They were so attentive. making sure I had a taxi, that I had water, that I was not bored, that I had a chance to try every bite of different curry from Brick Lane. It was fantastic. 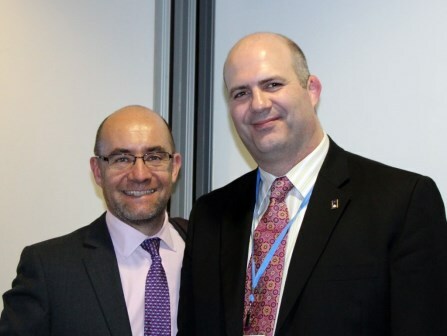 I hope that I have made friendships that will persist the conference. I have just been invited to attend the C21 Canada Summit for the 2nd year in a row. Last year it was Summit 50. 50 people by invitation only. I was lucky enough to be 1 of only 2 classroom teachers in the crowd, surrounded by CEO’s, ministers, Faculty of Ed, and politicians. 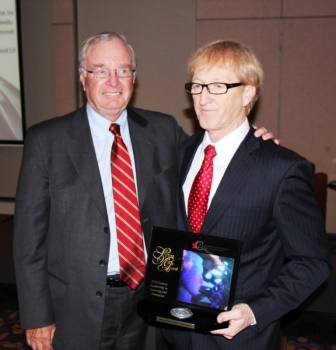 This year it is Summit 100, and the Hon Paul Martin will be giving a talk. Now to find the cash to attend. David Warlick mentioned me and our Science 12 Shark Lab Manual at the most recent national meeting of the Discovery Educator Network (DEN) in Montana. In 2006, I was most fortunate to be seated beside an individual whom I did not recognize at a provincial education conference. After a quick chat about a shark lab manual, the guest of honor was called up to give the keynote. Lo and behold, I had been sitting beside David Warlick this whole time. He asked if he could use the RHS Science 12 lab manual as an example for his upcoming talks in Alberta and Texas. Of course I said he could. According to Jeff Whipple who has seen and read Warlick numerous times, David has been often using that example since, including just a few weeks ago. Rumor has it that the lab manual appears in one of his books. We have yet to confirm it. I have mixed feelings that I’m not sure how to process. On the cool side, not only did our work make it to David’s cool list, but it is still cool in 2012, 6 years later. On the sad side, education is moving so slowly in some cases, that something that was done 6 years ago is still cool.